In the name of “5G acceleration,” companies have announced their support for “non-standalone” 5G new radio. But what on earth is “non-standalone” 5G? During the Mobile World Congress (MWC) in Barcelona, conversations over 5G have not only kept drifting back to 4G, but also quietly shifted from 5G's "Core Network" to "New Radio (NR)." In 2016, MWC was all about the promise of 5G networks. Vendors then talked about how 5G will be nothing like 4G—opening up a world of new possibilities for operators. As elements like software defined network and network function virtualisation come to the core network, they promised operators should be able to provide many types of differentiated network service over the same infrastructure. The MWC last year painted a picture of 5G that was both exciting and a little frightening. A year later, at this week’s MWC, the conversation on the show floor kept drifting back to 4G. Tech vendors discussed how the industry can still milk the LTE network for years to come. I noticed this trend when I saw the announcement of “non-standalone 5G”—jointly issued by a group of carriers and tech companies—just a day before the MWC opened. In the name of “5G acceleration,” companies including Ericsson, Huawei, ZTE, Qualcomm, Intel and a host of network operators including AT&T, Deutsche Telekom, KDDI, KT, NTT Docomo, SK Telecom, Sprint, Vodafone and many more, have announced their support for “non-standalone” 5G new radio (NR). This new proposal will be proposed at the 3GPP Radio Access Network Plenary meeting scheduled next week in Dubrovnik, Croatia. But really, what on earth is “non-standalone” 5G? How is it different from 5G? Is this something like 4G on steroids? More important, how does this detour affect all the market’s stampede toward 5G? As Qualcomm’s CTO Matt Grob explained in a one-on-one interview with us, “non-standalone 5G” is about a 4G-based “set-up” mode for 5G. By introducing the concept of an “intermediate” step, operators will be able to use the existing LTE radio and evolve packet core network under a configuration called “non-standalone 5G NR.” This would allow the carriers to begin trials and deployments of 5G NR in 2019, rather than 2020. Meanwhile, they can add a new 5G radio access carrier to support 5G use cases from 2019 onwards. Perhaps, most significant about the notion of “non-standalone 5G NR” is that this “solidifies” the schedule for the complete standard, including standalone 5G NR in Release 15, at a time when some 5G versions, from carriers like Verizon and Korea Telecom, are outpacing the competition. In short, the companies who support the non-standalone 5G are calling the tune before the band is assembled. They want the 3GPP to completing the 5G NR specs in the biggest possible hurry, lest the divide among pre-5G specifications grows even wider. We don’t know that answer. It’s unclear whether the invention of non-standalone 5G can put the genie back in the bottle. Meanwhile, during the MWC, evidence piled up that the mobile industry is not unanimously gung-ho about non-standalone 5G. And why not? 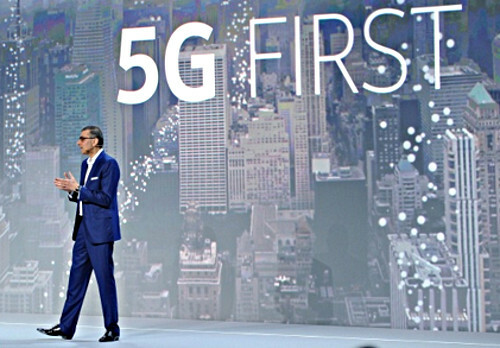 For example, Nokia was conspicuously absent from the list of companies joining the non-standalone 5G club. Nokia never gave a straight answer to the repeated question during the company’s press briefing. But the Finnish company seems worried that accelerating the NR standard might not synch with the development of a 5G packet core that will enable key features, such as network slicing. Similarly dubious voices on the show floor pointed out that the players rushing to close down the 5G NR spec today are focusing exclusively on 5G use cases, based on what they know about current 4G applications. Every time the mobile industry start developing a new radio standard, vendors and carriers tend to get busy with political jockeying and the new-standard hype machine goes into overdrive. Predictably, the media goes along, handwringing along the way. We’ve seen this again and again as the cellular standard went from 2G to 3G, 3G to 4G. Distinctly different from the past is that 5G isn’t just about developing a new radio spec in pursuit of faster speeds and bigger bandwidth. Obviously, the importance of stabilising the 5G NR spec—sooner rather than later—is a big deal. But what about the rest of the stuff that goes along with the 5G core network? Where are we? Have we thought through all the new 5G use cases we haven’t been able to deliver on 4G networks? If the latest fuss isn’t just a matter of some companies trying to one-up some other companies, what’s the all-fired hurry? This article first appeared on EE Times U.S.